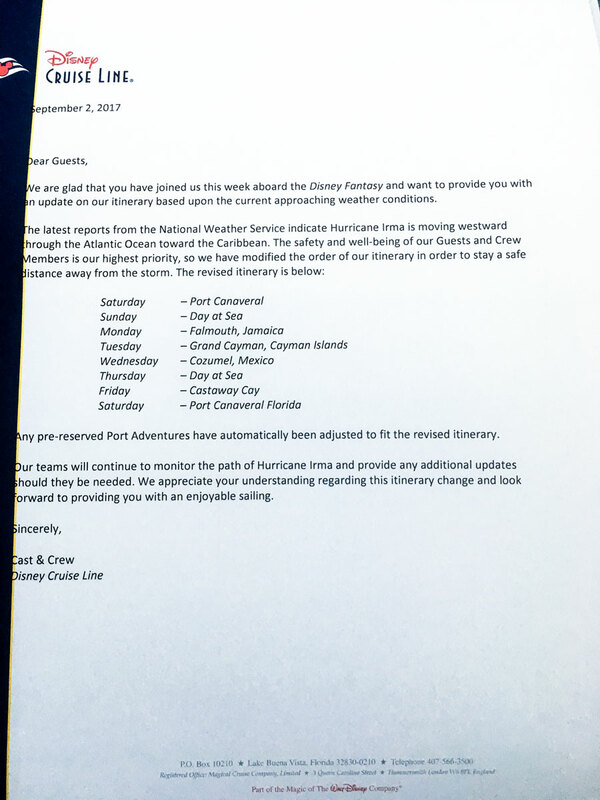 The following letter is being shared with guests checking in for today’s cruise at Port Canaveral. I’d like to thank Paul Morrisette for emailing us a copy of the letter. 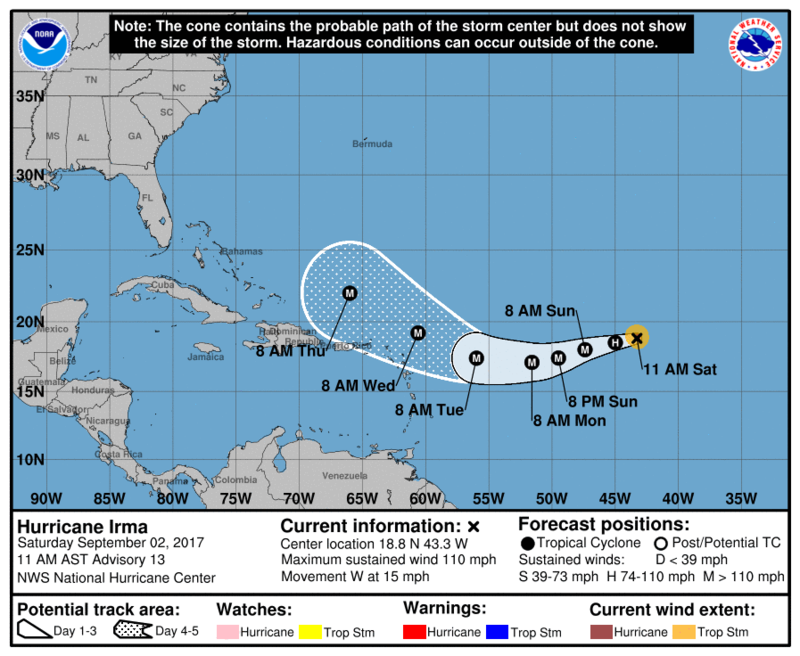 At this time the National Hurricane Center is issuing advisories on Hurricane Irma and the current forecast inicates it will intensify to a a major hurricane with a track that keeps the system, for now, over the open waters of the Atlantic Ocean. The other models are in agreement which is a promising sign this will be the only change in the itinerary. Finally, we have a look at the day 1 personal navigator tweeted by Dustin Burton. Although, the Navigator was not updated to reflect the itinerary change. This entry was posted in Hurricane Season 2017, News and tagged Disney Fantasy, Hurricane Irma by Scott Sanders. Bookmark the permalink. Any worries or changes to the Sept 9th cruise? I just called their hotline and it says Sept 9th Cruise is still a go. I know this is hard to predict but any idea what the possibilities are for the 9/9 fantasy sailing? Given that the current models are showing that around Saturday she should be near central Florida, it will be interesting what the departure will look like. The Disney Cruise hotline, right now, says the cruise is happening. Of course given the fact that 2 out of the 3 ports we will be visiting are experiencing a Cat5 as I type, I don’t know what we will be doing beyond floating in the Atlantic. I’m wondering also. Florida Governor Scott has already declared a state of emergency. Yes. I spoke with them earlier. Right now they plan on going if the hurricane stays on the track it is on. This is for the September 9th fantasy. They are going to try their best not to cancel. The destinations may change, though they did not say to where. Disney cruise line is crazy for even trying to work around hurricane Irma, they are putting people lives in jeopardy. smh. They should allow people to reschedule because this is going to be a scary not a magical ride of your life. Jan, the Disney Fantasy is returning to Port Canaveral on Thursday. September 6, 2017 – 5:30 p.m.